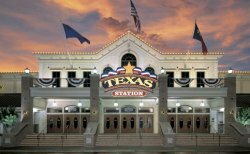 Texas Station Casino and Hotel has a 140,000 square foot casino gambling floor with 2,000 slots, 41 table games, race and sport book, poker, bingo and hotel. Poker: Nice eight table poker room playing all the popular games. Sportsbook: Place your bets and sit back and watch your favorite race or game. The 200 rooms are all large, clean, comfortable and affordable.